Do you need lot of money to enjoy life ? Probably not. There are lot of activities which you can carry out without spending fortunes on. The only thing is you have to figure it out and teach your mind, that you can be happy without spending loads of money. Most of the times, lack of money make us miserable. I don’t deny this. But if your basic needs are met, you can feel happy and enjoy your life. Even you can save little money by incorporating these things to your daily lives. 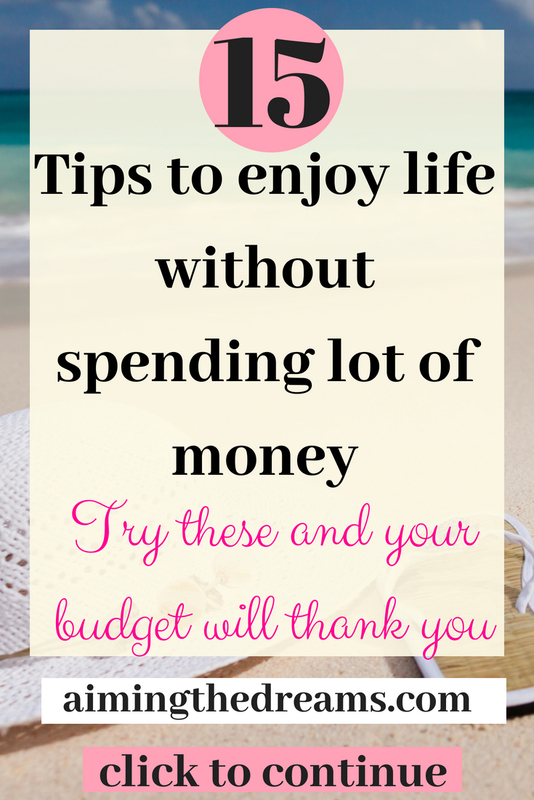 Learning to enjoy your life without spending any money becomes necessary, if you are on tight budget. It becomes difficult to spend lot of money if you are on single income. There are two ways to go through this situation. Either stop enjoying your life. Always stay inside your home and save money. Or you can find some ways to enjoy your life. This is our situation now. I have to stay home to take care of the baby. But these are the precious moments and these doubles as you get to enjoy without spending lot of money. I have some of my favorite things to do to refresh myself without spending lot of money. Rearranging your home really gives a satisfaction that we have done some nice job. And you can see the end result immediately. Better than watching a movie. Right. You have a beautiful home where you can sit comfortably now and admire your own creativity. Change the settings of your furniture and change the position of your rugs. This gives totally new look to your house. Think upon when when your whole family sat together and had a laugh ? If it is a daily routine then you don’t need to do anything. Carry on. But if it a long time since you had a good chat together, why not make it atleast a weekend ritual. Sit together and talk to each other. Have good time. These moments will always be your most cherished moments. It increases bonding in family. And please no phones in that time. Meeting and talking to your friends is therapeutic. You can share your joys and sorrows with your friends. They have similar kind of vibes. Because you chose your friends. You cannot choose your biological family but you can chose friends. Friends give you reason to not only smile but for a big laugh. My friends are so dear to me . They are at different places and in different time zones but thanks to internet, we can talk and message to each other instantly. Whenever I check my phone, there are always messages from them. Which is great. Start a kitchen garden in your backyard. Work daily on it for sometime. It will not only give you enjoyment but fresh vegetables also. These vegetables will be free from pesticides and chemicals. Enjoy life while doing those activities which don’t need much money but gives you internal satisfaction. Yes please go out and meet your surroundings. Watch those beautiful trees and beautiful gardens in front of the houses. See how so many years have passed and you have never seen your neighbors. Now is the time to pay attention to your surroundings. If you have beach near to your home, you can go and have a walk on beach. This is my favorite. Though beach is not very close to us but it is possible to go there and have good time. I feel like the sound of waves is the best music in the world.And you don’t need to spend a dime to enjoy this God made wonder. We all have beautiful parks in our localities. 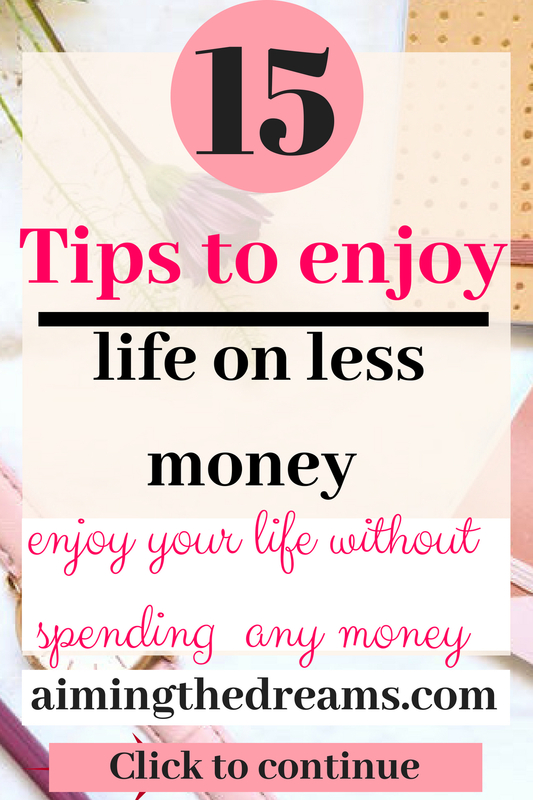 It is best way to to enjoy and without spending any money. Have a walk to your nearest park . You meet lot of people there and children also enjoy a lot as there are so many swings and other playing areas. Hey, go out and have a good jog. If you don’t want to jog, just have a brisk walk. Jogging or walking will let you exercise and take more oxygen. This is healthy for your body as well as wallet. Working on your relationships is necessary. Lack of enough money could be an opportunity to take your relationships to another level. I mean if you cannot go out why not go for a walk together or sit outside. Just enjoy the chirping of birds. Or if is bit night, see the twinkling stars. But if it is a cloudy night then you have no choice . You have to sit indoors to talk to each other and if you seriously pay attention you will feel that you both haven’t talked seriously since a long time. This is one of my favorite activity. I love to go to libraries and read books and magazines. You don’t have to shell out any money for that. If you have children, libraries arrange some activities for children also. So not only you but kids can enjoy also. You ca make library cards and accesses free internet also. Start a religious practice which is not only enjoying but gives a kind of satisfaction also. Religious places are great for socializing and you may make good friends there. Volunteer some where for free work. You will feel enjoyment as well as satisfaction of doing something worthwhile. One of my friend told me that she volunteer for one day in a week at a salvation store. I found it to be a good idea. And I met some people who volunteer at shelters. One of my friend was going through divorce and she got a place to live where so many homeless were there. People came there to volunteer for taking care of those who need their help. This is a good idea for spending some time with people who really need your help. Sit on couch and watch free TV. So many good programs are aired on free TV that you will not miss your paid TV. Enjoy your time with family and watch good programs. You can enjoy in the cozy atmosphere of your house. And without spending any money. Museums are great way to enjoy your time. 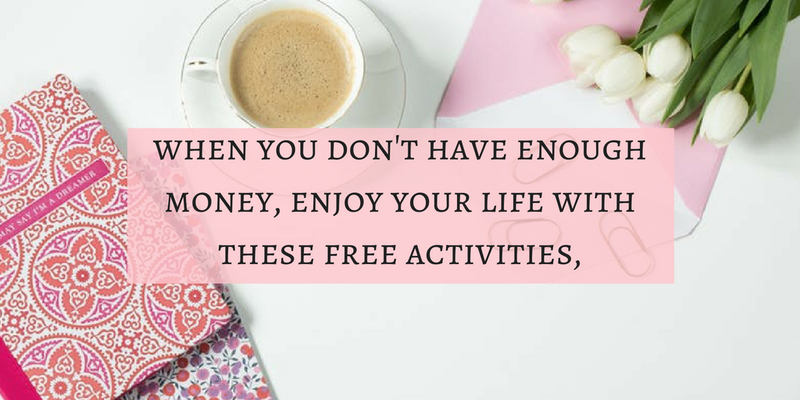 They are free or with very less money you can spend your time very well. You will not only enjoy but gain plethora of knowledge. We went to Melbourne Immigration Museum and get to know lot of things about the people who arrived earlier. Go to mall but don’t take money or cards with you. This is my way of enjoying. I stay home most of the time but once in a week I go to shopping plaza near my house. I spend nearly 2 to 3 hours there once a week. It just refreshes me. Not spending money while in shopping center also is an art. Learn this art and you will love your brains creativity to deceive you on not spending money. 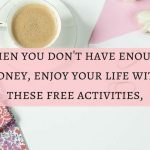 These are all my favorite activities to do to enjoy life without spending lot of money. Please share this post if you like it. And tell me how you enjoy without spending money. I would love to add more activities in my list. Stay happy. Hey Gursimrat! I like your ideas! My hubby Jerry and I have collected a large number of VHS movie videos and a few DVD movies. We have found them in thrift stores over the years for very cheap…many for as low as 25-cents! Usually, we pay less than a dollar for each—we refuse to pay more. So…this is our nightly entertainment! We don’t have TV reception, only a TV set. It’s an old analog set—we never went digital. We have an old video/DVD player, which, when it starts having trouble playing our movies, we take to get repaired. We have quite a library of movies, so we watch them over and over, but wait several months or a year or more before seeing one again. Hi Cindy, thank you for stopping by and reading. This is really a good way to enjoy life. Because in pursuit of enjoying life, people spend lot of money which is not a good idea. Thanks. I live in a rural village in Wales and we don’t have an ariel, so only get a handful of free to view channels. I have a big library of movies, too and regularly put one on in the background while I’m writing. I have lots of charity shops around me, so tend to do the same as you and pick them up for around ¢50. it’s a great way to save money! I recently stopped paying to run on a gym machine and start running out in my home town. Not only is it saving me money, but it made me realise that my surrounding, which I usually take for granted, are so beautiful. Thanks Suz for stopping by and reading. It is like this when we go out and see our surroundings, we feel realize how beautiful they are. Fabulas post I enjoyed reading your list a reminder of some simple things that we tend to forget . Glad you like it. Yes simple changes and small things matter a lot in life.